Our 5 Favorite Diffused Light Lamps in 2019! Whether you have a sensitivity to harsh fluorescents or simply prefer environments with lower light, you might want to consider getting a lamp with lower light. Especially since it makes reading and relaxing at home much easier because of the softer light. When your eyes are strained under severe lighting, you may experience eye strain or develop headaches. Luckily, there are several lamps to choose from and we’re even going to narrow down the options for you. Here are some of our favorite lamps that give soft, pleasant diffused light. When it comes to desk lamps that give your room a soft glow, the AUKEY Desk Light has a modern, sleek design that is bound to impress. The LED light casts a pleasant light in the room with five levels of intensity. This lamp consumes up to 75% less energy than regular bulbs, which leads to more money in your pocket. If you plan on relaxing with a good book or need to get a lot of work done, this lamp will make it easier to focus. One of the best features of this lamp is that it remembers the last mode that you set before it switched off. Another helpful little detail is that you can charge electrical devices using the USB port on the back. This AUKEY lamp is both contemporary and functional making it one of our favorites on the list. For those seeking a bedside lamp with touch-sensitive controls and minimalist design, look no further. With a combination of cloth and metal, Seaside Village has created a lovely lamp that is perfect for side tables, desks, or bedside nightstands. This lamp has four different lighting levels, that you can personalize to your liking. Its stylish design makes for a nice addition to modern decor. For those who would like to have ambient lighting in their home office, this lamp casts a warm glow, making the space feel warm, comfortable and secure. 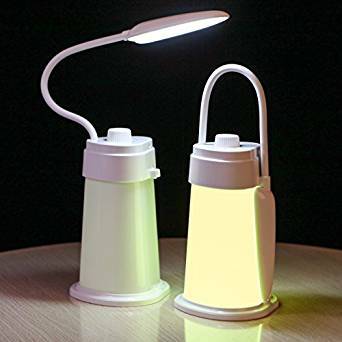 If you prefer a portable option, this battery-powered lamp for children is highly versatile. This lamp uses a quiet dimmer knob to control the brightness of the light. You won’t have to worry about disturbing your child while they sleep since there are no annoying clicking noises. It can also be carried as a lantern giving off a soft glow, which is perfect to serve as a nightlight. 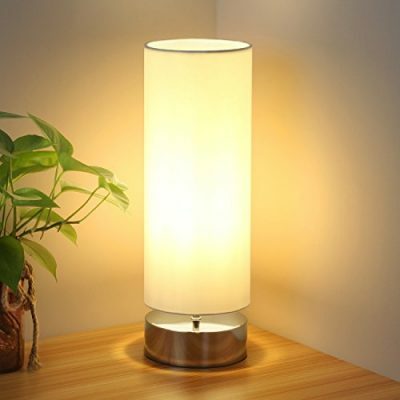 If you need more light for reading at night, then you can fold out the arm of the lamp to use as a reading lamp. The runtime for this lamp varies from 3 to 12 hours depending on the intensity setting of the light to provide long-lasting light that won’t tire out the eyes. When you want to wind down in the evening, you want to sink into the sweet embrace of the night. It only makes sense that you have a lamp that has the perfect balance of light and functionality. It’s compact and ideal to take with you on the road or use it at home. The LuminoLight Book Light uses 6 LEDs and three brightness levels to ensure that you are getting the perfect light at night. 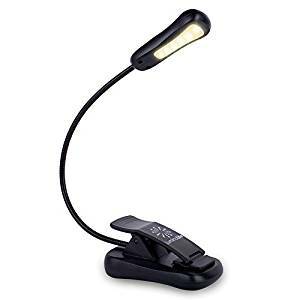 This lightweight lamp is light enough to clamp onto a book, yet strong enough that you won’t have to worry about it slipping down or flopping around. Plus, this book light is rechargeable so don’t need to be concerned about when the battery will run out. When finding the right light for your living room or bedroom it can be difficult if you don’t know what to look for. Is your style more modern and contemporary? Do you prefer lighter or darker colors? 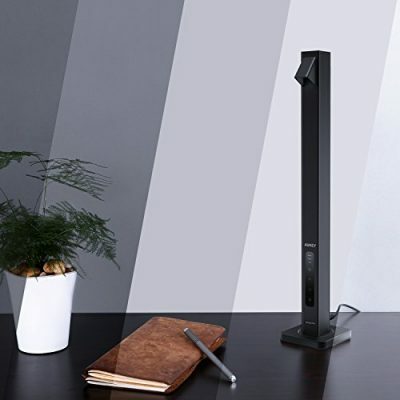 Wherever your tastes may lean, Brighttech has you covered with their USB Shelf Floor Lamp. 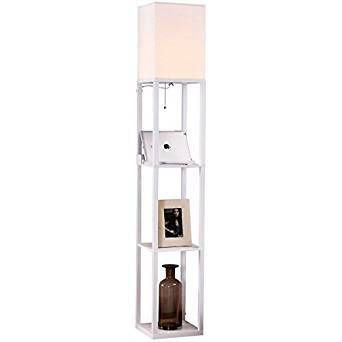 They have combined storage with style in their stylish, 63-inch tall lamp. With 2 USB ports on the shelf, you can charge everything from mobile devices to laptops. So it’s an economical option for those who want quality lighting without spending a ton. When it comes to finding the right lighting for your home it’s important to not only consider the style but also the intensity of the light. Remember that gentle, soft light is easier on the eyes and decreases the chances of eye strain to occur. To be on the safe side, it’s best to choose lighting that uses LED bulbs with adjustable dimmer light settings since they use less energy and last longer and traditional light bulbs.